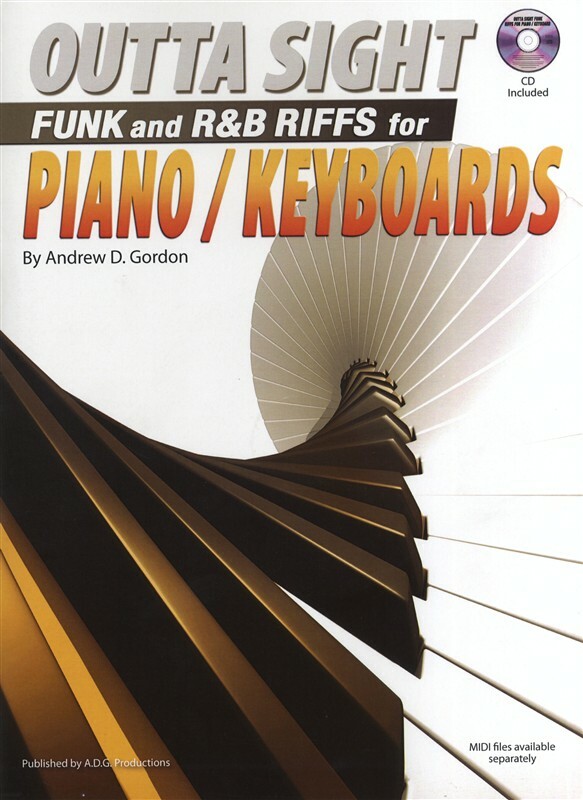 Outta Sight Funk and R&B Riffs for Piano/Keyboards is designed to help piano/keyboard players improve their playing technique with a wide range of different Funk & R&B riffs and grooves. What is Funk music? Funk is an Afro American musical style originated by James Brown and later Sly and the Family Stone emphasizing the rhythm and putting melody and harmony in the background. Funk often consists of a complex groove where every instrument is playing a different rhythmic part fitting together like a jigsaw puzzle. Entire songs are written without any or minimal chord changes where one or two riffs form the basis of the song as represented by the examples in this book. Each of the 55 examples has been recorded three times: 1. The left and right hand parts are played through twice with drums & percussion, guitars and keyboards at the regular tempo. 2. Rhythm tracks at the regular tempo of guitar, bass, drums & percussion to practice the keyboard parts along with. 3. Slowed down track of the left & right keyboard parts with the drums so that you can precisely hear what the keyboard parts are playing. Comes with play-along CD.